MPC Farmer quota Admission Notification for B.Tech. (Ag Engg) and B.Tech. (Food Tech) courses, PJTSAU MPC stream B.Tech Agriculture Degree Courses Admissions 2018, Agriculture B.Tech courses, PJTSAU Agriculture B.Tech. (Agricultural Engineering) and B.Tech. (Food Technology) course admissions 2018,online application form, last date for apply online, list of documents for certificates verification, selection process and registration fee details given here. 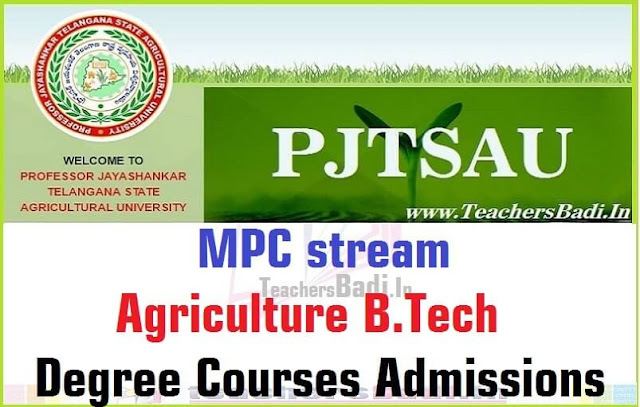 Professor Jayashankar Telangana State Agricultural University, Administrative Office will give the MPC Stream courses(Farmer's Quota) Degree course admission notification and ONLINE applications will be invited for admissions into the following degree courses of Professor Jayashankar Telangana State Agricultural University(PJTSAU), Telangana State for the academic year 2018-19. Farmers quota PJTSAU B.Tech Programmes. The candidates coming from families of Agriculturists (Farmers) owning not less than 3 acres of land either in the name of the parents or in the name of the candidates and who have studied for a minimum of 4 years upto intermediate or its equivalent located in Non-Municipal areas. If the land is owned by grandfather, grandmother or guardian or any other relations it is not acceptable. The seats in the M.P.C. stream coursesof PJTSAU under Non-Farmers quotaviz., B.Tech. (Agricultural Engineering) and B.Tech. (Food Technology) shall be filled up based on the Ranks obtained in the Telangana EAMCET-2018 along with other engineering courses through single window system of Telangana State Council of Higher Education. The hostel facility to the selected candidates shall be provided subject to availability. Hence, the candidates who wish to seek admission into the above M.P.C. stream courses of PJTSAU are informed to attend the counseling conducted by the Convener of EAMCET Telangana State. Click to Download the Online Application form: ONLINE Applications are invited from eligible candidates for admission into MPC stream courses viz: B.Tech. (Agricultural Engineering) and B.Tech. (Food Technology) under Farmers Quota for the academic year 2018-18 based on the ranks obtained in Telangana EAMCET-2018. The last date for online submission of duly filled in application for the above courses is 10-07-2018. The Prospectus and Instructions for the applicants are displayed on the University website www.pjtsau.ac.in. The applicants are informed to visit University website www.pjtsau.ac.in on .......July, 2018 for the information pertaining to the dates for verification of certificates and for further procedure. Application for B. Tech. (Agril. Engineering) & B. Tech. (Food Tech.) courses under MPC stream (Farmer's Quota) : AY 2018-19. Last Date for application is 10-07-2018 (4.00 PM). Help Desk Nos. 8480427854 and 8480743506 between 10 am to 7 pm (Monday to Saturday). Eligibility: All the five conditions are to be fulfilled to apply under Farmers Quota. 2. If the candidate has studied in Non-Municipal area at least for four years from 1st class to Intermediate or its equivalent. 3. Minimum 3 acres of land either in the name of the parents or in the name of the candidates. If the land is owned by grandfather, grandmother or guardian or any other relations is not acceptable. 4. The selection of candidates for all the seats shall be made on the basis of ranks obtained by the candidates in Telangana State EAMCET-I-2018 in their respective local areas out of the merit list prepared for this purpose. The candidates will be selected based on merit by following rule of reservation. 5. The candidates for admission to these courses shall be required to have completed 17 years of age on 31st December of the year of admission with an upper age limit of 22 years for all the candidates, 25 years in respect of SC and ST candidates and 27 years for Physically Handicapped candidates. to enclose attested photocopies of pattadar pass book as an evidence of the extent of land(to be uploaded). Form-II: It is a proforma to be certified by the Head Master of the School with his office seal that the candidate has studied for a minimum period of four years in schools/colleges located in Non-Municipal areas during their period of study from 1st class to 12th class / Intermediate (Non-Municipal Area Certificate) (to be uploaded). Form-I and Form-II need to be filled in with the signatures of concerned officials viz., Tahsildar and concerned Head of Institution, respectively, along with office seal and to be uploaded. Otherwise, the claim of the candidates under this category will be summarily rejected. The dates, venue and the list of the candidates called for the manual counseling will be placed in the University website www.pjtsau.ac.in on .............2018. No separate notification with regard to counselling shall be issued. ii) Hall Ticket & Rank Card of EAMCET-2018. viii) Transfer Certificate from the College or School where the candidate last studied. 6. The applicant is informed that mere submission of an online application and attending to the counselling do not guarantee the allotment of seat. 7. Candidates are required to read the PROSPECTUS thoroughly. For any other information, that is not mentioned in the PROSPECTUS, the candidates may contact the following phone numbers between 11:00 A.M. to 1:00 P.M. and 2:00 PM to 4:00 PM only on all working days. Do not use the back button of the browser’s. Use the links and buttons available on the page to move from one page to another. The applicant should carefully read the prospectus before proceeding to apply online. You can either download a copy of the prospectus (Click here to download) or read it online. The candidates for admission to the various courses shall be required to have completed 17 years of age on 31st December of the year of admission with an upper age limit of 22 years for all the candidates, 25 years in respect of SC and ST candidates and 27 years for Physically Challenged candidates. After successful submission of the data, an application number will be generated and this can be used for future correspondence. The scanned passport size (3.5 cm x 4.5 cm) photograph of the applicant should be in JPEG format of and not exceed 50 KB file size. The applicant’s signature should be scanned in JPEG format of [3.5 cm x1.5 cm] and not exceed 1MB file size. The documents to be uploaded should be scanned in JPEG/JPG/PNG format only. Hall Ticket and Rank Card of EAMCET-2018 of Telangana State. Agricultural Land Holding Certificate - FORM-I (Click here to download): It is a proforma indicating the patta numbers and extent of land owned by the applicant / parents duly certified by the Tahsildar with his office seal (or) the applicant has to upload attested photo copies of pattadar pass book as an evidence of the extent of land. Non-Municipal Area Certificate - FORM-II (Click here to download): It is a proforma to be certified by the Head Master of the School with his office seal that the applicant has studied for a minimum period of four years in schools/colleges located in Non-Municipal areas during the period of study from 1st class to 12th class / Intermediate. Form-I and Form-II need to be filled in with the signatures of concerned officials viz., Tahsildar and concerned Head of Institution, respectively, along with office seal. Otherwise, the claim of the applicant under this category will be summarily rejected. Application fee: For applicants belonging to OC and BC social status, the amount is Rs. 1,325/- and for applicants belonging to SC, ST social status and PH category, the fee is Rs. 725/-. The applicant has to select Debit Card /Credit Card (Visa / Master Card)/NET banking/ Wallet option to pay the application fee and follow the online instructions to complete the payment of fee. After successful submission and payment, the applicant will be able to download and print the application form. The applicant should bring the originals of the uploaded certificates to the Counselling Centre at the time of allotment of seat.